Giving Tuesday is just a week away, and the holidays are right around the corner. All of which begs the question, how are you planning to give back this year? Please take this opportunity to consider a donation to support children’s programming at the newly renovated Ziegler Park – a safe place where neighborhood children can come together to grow, learn and play. We offer free or reduced-cost summer camp, swim lessons, recreational leagues, and a variety of other organized activities designed to engage neighborhood youth. At the park, we promote inclusion by strengthening the bonds of community through recreation. We welcome all, with a commitment to ensure that everyone in the neighborhood has a clean, safe and fun place to enjoy. It is our mission to offer free and reduced-cost activities, leagues, and clinics, as well as pool memberships for all. However, we cannot do this alone – we need your help! Starting next Tuesday, Nov. 27, donate to our cause and spread the word! We recently launched a campaign as part of the Cincinnati Gives 2018 Challenge in hopes of sustaining our free programming at Ziegler Park. 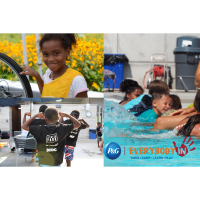 This friendly fundraising campaign, launched by P&G and Cincinnati Magazine, allows local non-profits to compete to raise the most money, with the top teams winning cash donations as prizes. The top fundraising campaign will be awarded an additional $15,000, with prizes also being given for second and third place. Everything starts on Giving Tuesday – Nov. 27th, and runs until Weds., Jan. 2. Will you help us achieve our goal? Please consider a donation to support the cause!